All chocolate lovers are going to love this! 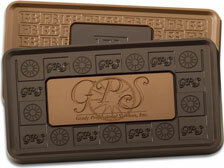 We offer Chocolate Combo Bars that have your customized design etched in dark chocolate in the center which is surrounded by milk chocolate. You can even have the flavor combination reversed. The candy bar measures 9” x 5” x ¾”. No Extra Fee for customization!